The Ben Hiant vent-complex (based on Richey et. al. 1930 and Gribble 1974). The purpose of this excursion is to examine the Tertiary and pre-Tertiary rocks of Centre 1 on the east side of Ben Hiant. Semi-pelitic Moine rocks are first observed overlain by badly exposed Mesozoic sediments, all these rocks being extensively cut by various types of Tertiary dykes. The basal Tertiary plateau basalts are observed overlying the sedimentary rocks and also an igneous agglomerate infilling an early vent on Ben Hiant. Finally, some of the other Centre 1 rocks are examined, particularly andesitic pitchstone lavas, porphyritic and non-porphyritic dolerites and a small outcrop of trachyte. Total distance (Kilchoan-Kilchoan) about 26 km by vehicle: 4 km walking (very steep and hard in places). Cars may be parked in the road cutting on the south bank of a stream 0.4 miles (0.5 km+) south of the 13-mile post from Salen (room for two cars only). Locality 1. [NM 552 635 - NM 548 635]. Stream section examined during a traverse up the largest of three streams, that is the one beside the cutting. Figure 3 shows this area in detail. No exposures occur between the road and 100 m or so upstream. Always walk as close to the stream as possible. The first exposures, occurring just below a small silver birch tree in the stream, are typical Moine rocks comprising pale-coloured quartzites (or psammites) with micaceous bands. At this point a large dolerite dyke crosses the stream, cutting the Moines, and its contact is clearly visible in a small waterfall below the tree. Upstream a series of dolerite dykes is observed with occasional igneous/igneous contacts in the bed of the stream. These dykes continue upstream for another 60 m until Moine rocks are observed once more. At this point the river banks are more gentle and just enough Moine rocks occur to estimate their strike as north-west to south-east and their dip as 30° to the south-west. Two silver birch trees form an arch over the stream and here the Moine rocks show well-developed micaceous planes, dipping to the south-west at variable angles of between 20 and 35°. Further upstream, the rocks become more highly coloured, where three huge boulders occur. Several small dykes cut across the stream at this point, two of which are clearly seen on the north bank of the river. Above this point a major waterfall occurs more than 6 m high, with another waterfall just above it. The rocks here are still Moines, but quite altered from Moine rocks further downstream in that they are fissile and often strongly coloured, dipping south-west to south-south-west at angles of up to 40°. Above the second waterfall the ground flattens out and is grassy. Immediately above this occasional exposures of Triassic sediments of variable thickness (0.3 m) can be seen in the ~tream bed. In this section of ground the Lower Lias first occurs where the ground becomes boggy and, although exposures are rare, rock occurs about 20 m downstream from the foot of the steep valley (below the confluence of two small streams). A carbonated dyke cuts across the first stream and the boundary with the Tertiary plateau basalts is reached just below the confluence. Between the first basalts Richey et al. (1930) recorded occasional exposures of basal Tertiary muds but these can no longer be observed here. The plateau basalts here are thin and composed of an alkali-olivine type being best observed in the southern stream channel. The ridge separating the two stream channels from each other is controlled by a large east-west trending dyke which may be a multiple intrusion. Further upstream along the southern channel a series of knolls are reached on the south bank of the stream. At this point the east-west dyke on the ridge shows excellent variation features, especially a "brecciated" central section. A well­defined contact between basalts (below) and highly brecciated agglomerates (above) on the south bank of the stream channel should be noted, the contact of the vent wall dipping to the south-west at 20°, this contact occurring about 5 m above the stream bed. Above this point a large brown bluff on the south bank of the stream marks a dyke intruding the agglomerate. The river gradient now increases and the stream banks are steep. Climb up, examining agglomerate which becomes fresher and less brecciated, until the lip of the scarp is reached at the last waterfall. Continue upstream until a well-defined and easily observed north-east to south-west trending cone-sheet crosses the stream, shown on coloured map at [NM 547 635]. Go south-west from this point for about 1 km climbing over undulating and boggy ground until the final rock face leading to the summit is directly above [NM 537 629]. A gully trending north-west to south-east cuts upwards through these crags, and at the bottom of the southern line of crags (separated from the main rock face) good examples of porphyritic dolerite with large feldspar crystals and with occasional dolerite xenoliths occur. Behind this line of crags the main Ben Hiant dolerites are seen and one can climb up or collect from scree boulders fallen down. On a fine day Ben Hiant should be climbed both for the view to the south, where the major plateau basalts can be seen on the north coast of Mull, and the general view of the region including the Sound of Mull and Morvern. 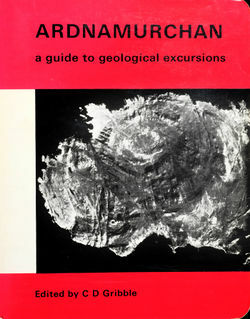 On the way up the dolerites can be examined in more detail (see p. 22). 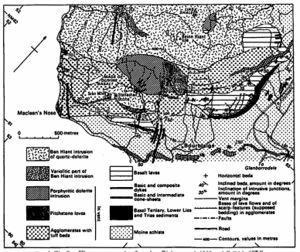 Return to the porphyritic dolerite and go south-eastwards to [NM 542 628], where pitchstone lavas occur as a hump at the south end of main slopes overlooking the old abandoned village of Bourblaige (see coloured map). Two or three individual flows may be recognised because of the vesicular character of the top of each flow and the dip of the boundary between the flows can be measured. After examination of all the rocks in this area return to the road, examining spheroidal weathering basalts well exposed in stream sections on the way. Return to vehicle and then go to 12-mile post from Salen and just north of bridge over the river Allt Torr na Moine at [NM 555 627], where a line of crags on the west side of the road marks a small flow of trachyte - the only observed rock of this type in the region. During the course of the excursion to Ben Hiant it is possible that a herd of deer will be observed, particularly in the valley which runs south-westwards from the bottom of the Ben Hiant summit. This page was last modified on 14 December 2015, at 00:36.